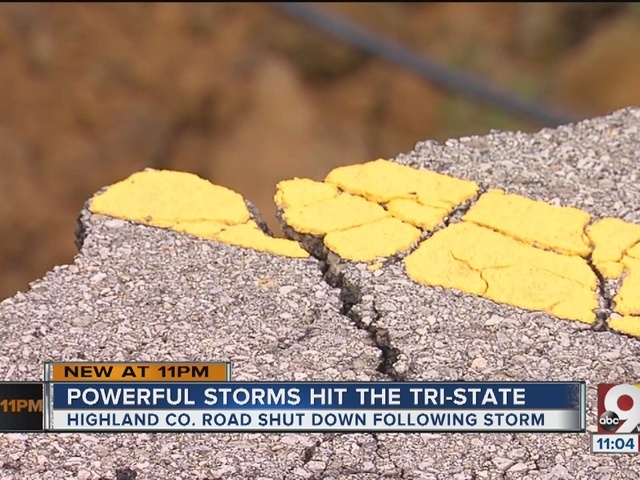 HIGHLAND COUNTY, Ohio -- This is more than just a pothole. Crews said Wednesday night that S.R. 785 could remain closed for weeks after heavy storms caused part of the roadway to collapse, and local residents said they had never seen anything like the cauldron of mud and water that used to be concrete. 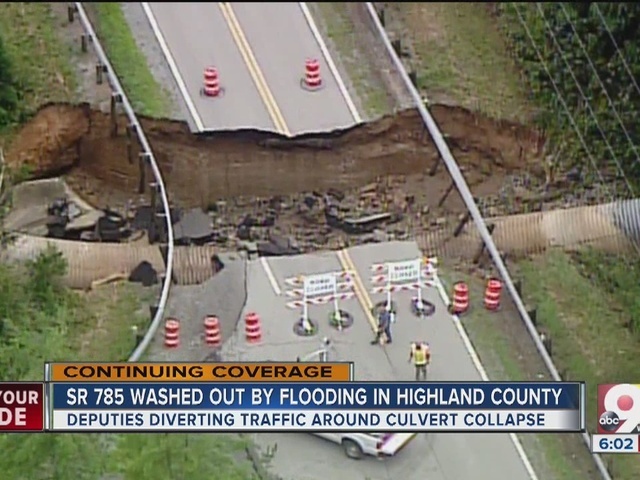 The washout and culvert collapse happened near Burgess Road, according to Ohio Department of Transportation officials. Chad Frazer and Jerry Miller were there when the collapse happened. "It was just water everywhere," Frazer said. "(It came) clear over the road, and a lot of pressure." Miller said that a vehicle parked on the road at the time of the incident avoided disaster by a hair. "I saw the guardrail post was flopping on both sides, and I saw there was a van parked there, and I was telling him to back up," Miller said. "As soon as he backed up, the road collapsed." ODOT officials recommended motorists use S.R. 73, 32 and 247 as a detour. Graham Bartram, a highway tech who works for ODOT, said he and his coworkers will do their best to "get it reopened as quick as we can."